Do you have a garden plot out back? Do you have a spot where you can grow potatoes on the soil that was left on the lot by the creator? If so, you have a good chance of growing potatoes. Growing taters in a container seems futile. Plant a potato patch. A 20 x 20 foot plot with 7 rows of potatoes would work. Put the potato sets every ten inches in the rows. When the plants are 8 inches tall hill the plants. Potatoes need good fertile soil and constant water. Don't let them get too dry. Bugs like the leaves. Keep an eye on them and take care of any insect problems. I use to grow good potatoes in Illinois 40 years ago but I can not grow good potatoes in Tennessee. My Russets are never grow larger than golf balls. Soil in IL is fertile but TN soil is clay. TN gets more rain than IL. TN is 10 degrees hotter than IL. Best potatoes I every grew in TN was in a stack of 3 car tires. 3 potato plants with soil up to the 3rd tire. It made about 30 large potatoes. It is best to grow potatoes in rows if you can make that work for you. Parts of my problem in TN is by the time seed potatoes are available and planted temperature is in the 100s the last half of the growing cycle of the plants. Often it rains here every day none stop for 3 months in the spring its hard to plant potatoes in a muddy swamp just have to wait until rain stops then the weather switches gears and garden turns to desert, no rain, and 107 degrees. I think potatoes to better in cooler weather. Jal is right plant in rows but I have no luck with anything I try. This year I have moles I think moles eat potatoes. The time I planted potatoes in tires I put those in the garden in Oct and filled them with dirt so they would be ready in March. March I walked out to the tires in 6" of mud and planted grocery store potatoes. Frost killed the vines a few times but I had good potatoes in June before the 107 degree heat..
Last edited by Gary350 on Fri Feb 19, 2016 1:50 am, edited 3 times in total. Moles don't eat potatoes -- they eat earthworms, grubs, etc. But field mice will use the mole tunnels and THEY eat potatoes. I had that problem with some of my potatoes -- gnaw marks on the taters, some entirely eaten. Between the mice and wireworms, I cannot leave potatoes in the ground too long, and I'm better off harvesting them smaller than they can get, before they get eaten. Robbing new potatoes often also discourage the mice from exploring the tater hills. I've also switched to mostly early and early-mid maturing varieties. When I grew them in the chickenwire silos, I used combination of spoiled hay and straw (NOT previously used as animal/poultry bedding), compost, sand, soil, pine straw, leaves, grass clippings.... I don't think you should use uncomposted manure. Not everyone has the luxury of a potato patch in the ground. In my new suburban location with a half-acre "farm" ( ) I will have a potato patch. Where I used to be in the city, I couldn't. So I did try growing potatoes in the bottom half of a 50 gallon drum, (actually plastic trash can, the kind you take out to the curb) with plenty of drainage holes added in the bottom and sides. I put a bit of good enriched top soil in the bottom, just a few inches, then my seed potatoes and then a couple more inches of soil. Then after the potato plants wer up and growing, I kept gradually adding more soil. 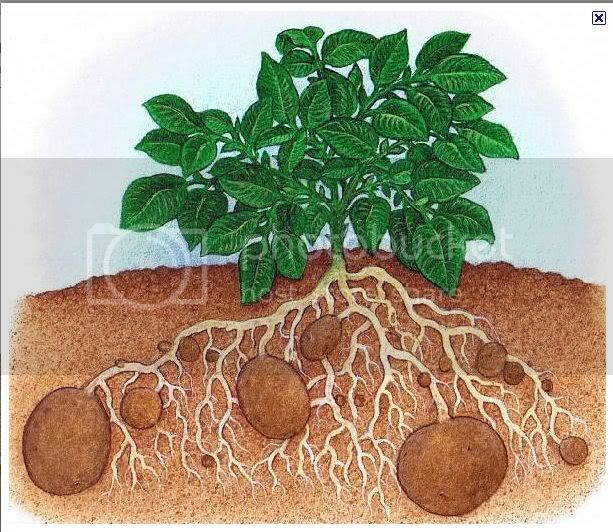 New potatoes come off the roots, between where your seed potato is and where the plant is. In the ground, they don't have to be hilled up very high, because they can spread out horizontally, but grown in a tub they don't have that luxury. But you need to be sure as the potatoes are growing and you are filling the bucket, that you don't fill too fast and you leave your potato plant plenty of leaves. The leaves are what give it the energy to grow and produce those tubers. What you want is basically good enriched topsoil, but you can mix in a bit of grass clippings (if they don't have chemicals on them) and leaves. You can definitely grow potatoes that way, but I will say that my potatoes never got very big either, not much more than the golf ball size mentioned. But they tasted really good! I plan to go with the grow bags again this year, and plant before May. Duh! The bags I have are 7 gal. and I'm hoping to have several going with different varieties. Gary, FWIW, the seed potatoes have been in the box stores here for 2 - 3 weeks. When talking to a fellow market vendor, she said she plants potatoes 1st week March. That's about now! I plan to wait until end March. Our frost is mid April. The potato: it seems the potato is a regular part of our food intake. From hash browns, french fries, mashed potatoes and gravy to baked potatoes. The potato shows up on the menu in any restaurant. Yep, we use a lot of potatoes. So it would seem that growing some in a bucket or drum is maybe a fun experiment, but is not going to give us the food we really need. A potato patch is more appropriate. Yes, hilling potatoes is a good thing to do, it covers the tubers so the sun doesn't hit them and turn them green. If they go green they get a strong taste. But, it only needs to be done once, and only a couple of inches of soil pulled up around the plant to cover the tubers well is all that is required. I've watched this video several times and marvel at the enormous harvest this guy got. The variety is Sarpo Mira, but I don't think it's available here in the U.S. Makes me want to attempt potatoes in a container. Did a quick search and didn't find this variety either, though there's some chatter that Tom Wagner might be developing some TPS from F2 seeds grown segregates of Sarpo Mira crossed with other varieties. It seems to have some unique growth qualities in addition to the blight resistance, so maybe look for available varieties with similar traits? Particularly, noticed caution that -- paraphrasing gleaned descriptions here -- ("unlike regular potatoes") once it develops tubers (Late maturing, I think?) it continues to increase the tuber size rather than dying off until the tubers are too large and "Floury"* so needs to be monitored and vines cut down at desired stage to arrest tuber development. This might be the trait which makes it grow well in the big tubs that might not be replicated by most other varieties? *some one described the "Floury" trait as falling apart when boiled too long -- which to me indicates a type of potato that's good for baked potato and French fries rather than boiling for potato salad or stew for instance. Amazing crop of potatoes in pots, it makes me want to grow potatoes in pots. He has some nice looking soft soil I bet that helps. I wish I know more details. I wonder what his weather conditions are. Potatoes in pots might be good to grow in a green house 75 lbs of potatoes in one harvest would be too many potatoes to keep all year unless you have a good place to keep them cold year round. My grandparents had a root cellar in IL but in TN that would be a swimming pool. I have always been so determined to grow potatoes in the ground maybe that is not the correct way for TN swamp land. I should try several experiments this year to see what works, after living in TN 38 years you would think I could learn how to grow potatoes here by now. I need a potato variety that likes, mud, rain every day and 100+ temperatures in June. That silo full of potatoes would be awesome. james.... if you have room for a potato patch, that is a good thing. I am excited to try this year. Many city dwellers just don't and there is no reason they shouldn't try growing a few potatoes anyway, even if it is on a sunny balcony. And when your potatoes are in the ground and spreading out horizontally, (I guess) they only need to be hilled once. Growing them vertically in a tub, you do need to keep adding soil to give them vertical space to produce potatoes in. Tried the silo method a couple of times and I failed both times. My failure was not to monitor the soil moisture during the season. With proper soil temperature and moisture it may have made a difference. I killed the plants about halfway through the summer. While the idea is great for someone with limited space, I would rather plant in the ground. I use the dig a trench, put the potato in and fill with straw and compost just to above the potato. Then as the plant begins to grow add more straw/compost until the trench is overflowing. That makes harvesting easier by just hand removing straw rather than digging. I read too that the Sarpo Mira can be kind of starchy and floury. I have one container like those large ones the guy in the video was using, I think I'll try a couple of seed potatoes in there this year just for fun. In another video by the same guy he did an experiment where he planted the potatoes in different mediums: pure compost, plain old garden soil, soil with peat etc. Surprisingly, he had as good results with just the soil by itself. In a new location where I'll be gardening there are a lot of gophers too. I'm trying to keep up with them, but I think they may wreak havoc with my root crops. The container will at least eliminate that problem. Brussel Sprouts Pictures and Growing Method. My experience.